Colorado’s breathtaking mountain hikes, stunning waterfalls, towering canyons, and rich history make this state the perfect camping destination. If you’re looking for exciting outdoor recreation and jaw dropping sights, add these 9 beautiful Colorado destinations to your bucket list. If you’re ready for an unforgettable adventure, Rocky Mountain National Park is your new must-see destination. From dense forests and alpine lakes to majestic mountains and an abundance of wildlife, this park has something for everyone. Visitors can explore more than 300 miles of hiking trails that lead to meadows bursting with wildflowers, cool forests, and glimmering lakes. This park is home to the Trail Ridge Road, the highest paved road in the US at a staggering 12,000 feet. Stand amongst towering sandstone formations as you bask in the glory of snow-capped Pikes Peak. This National Natural Landmark boasts 15 miles of hiking trails, horseback riding, biking, and endless awesome photo opportunities, and best of all, it’s free. 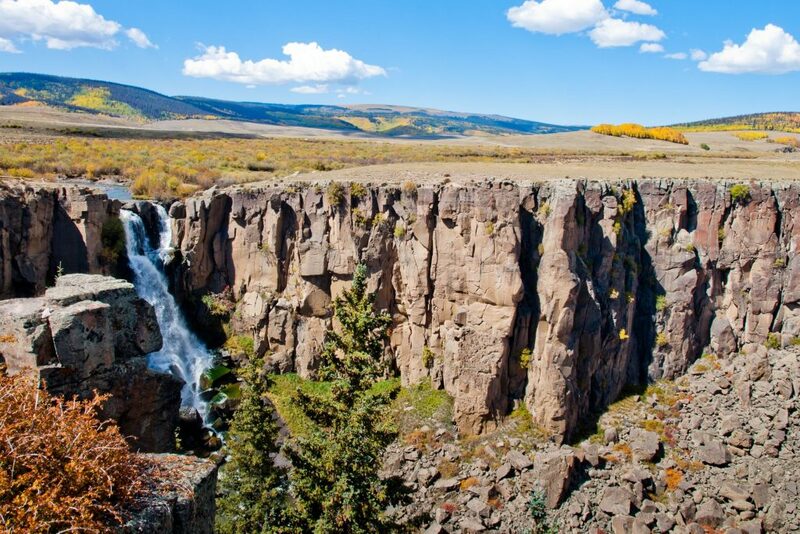 The Gunnison River has been sculpting these breathtaking cliffs for more than 2 million years. Experienced climbers and hikers will meet their match at this beautiful park, but easy nature trails are also available for those looking for a relaxing stroll. Kayaking, fishing, scenic drives, and wildlife viewing are also popular at Black Canyon of the Gunnison. After a short but steep hike, you will come upon this magical turquoise lake complete with enchanting waterfalls. Nestled within Glenwood Canyon, Hanging Lake is perched on the edge of a cliff and looks like it was plucked from a fairy tale. Swimming isn’t allowed due to the fragile ecosystem, but feel free to take as many photos as you’d like! Named a World Heritage Site in 1978, this beautiful park protects thousands of amazing archaeological sites. Mesa Verde is home to hundreds of cliff dwellings, and they are well-known for being some of the best preserved sites in North America. Numerous trails can be found throughout the park as well as 200 species of birds and 75 species of mammals. If you’re looking for a truly unique experience, add Great Sand Dunes National Park to your list. With 30 square miles of dunes, you can spend hours sand sledding or hiking in this beautiful park. Venture through Medano Creek, watch for wildlife, and at sunset, sit back and marvel at the beautiful colors splashing across the sand. One of Colorado’s most visited locations, the majestic twin peaks of the Maroon Bells are surrounded by crystal clear streams, pristine lakes, lush forests, and alpine meadows. You can explore this beautiful wilderness on more than 100 miles of hiking trails. In the winter months, relax in deliciously warm hot springs, go snowshoeing, or discover wildlife while cross-country skiing. Located on the border between Colorado and Utah, Dinosaur National Monument boasts 200,000 acres of mountains, rivers, canyons, and desert. Discover fossils still embedded in rock, intriguing petroglyphs, go on a rafting adventure, or take a ranger-led tour. This dramatic waterfall is one of the most photographed falls in Colorado. The stroll to the overlook at this observation point is short and sweet, and offers great vantage points for pictures. If you like picnics this would be an amazing spot to stop for lunch. The waterfall is surrounded by the Rio Grande National Forest which is known for its hiking trails, fishing, mountain views, biking, and scenic drives. Want to explore campgrounds? Discover beautiful Colorado campgrounds with amazing amenities and stunning views on Camp Native.